A South Korean Buddhist nun is helping vegan temple cuisine go global. Her recipes and culinary philosophy have influenced chefs and foodies around the world. A South Korean Buddhist nun is helping vegan temple cuisine go global. Her recipes and culinary philosophy have influenced chefs and foodies around the world. But, this celebrity chef has stayed connected to her spiritual roots. Reporter Jason Strother recently paid Jeong Kwan a visit at her mountainside temple, 270 kilometers south of Seoul. When I arrived at Baekyangsa temple in South Jeolla province, I was met with rain sliding from tiled roofs. The venerable Jeong Kwan was waiting for me in front of Chungjinham convent. Like all Buddhist monks and nuns, Jeong Kwan’s head is shaved. Dressed in a grey robe, she looks grandmotherly. She won’t tell me how old she is, but then again, age is just a number. The nun has lived at the temple since she was 17, and she’s been cooking for even longer. She says she feels a spiritual connection with the food she prepares. Jeong Kwan speaks mostly in Buddhist spiritual terms- it’s a little over my head. But this perspective on food and life is what’s made her a celebrity, philosopher chef. Last year, Jeong Kwan was featured in the Netflix documentary series The Chef’s Table. Now food lovers from far abroad come on pilgrimage to Baekyangsa to learn from her. But Jeong Kwan says her new celebrity status hasn’t changed her. She’s a monk first, chef second. Inside a sanctuary, Jeong Kwan shows me how to pray in front of a large Buddha statue. She says there’s no difference between meditating here, or cooking in the kitchen. “To me, cooking is like praying. When I enter the kitchen, I enter without thoughts. It’s just like I am bowing to Buddha. I concentrate only on myself and what I’m doing at that moment. I hope that those who eat what I’ve cooked feel happy and at peace,” she stated. The kitchen is where Jeong Kwan says she can best communicate with others. Standing in front of the stove, she’s preparing seaweed soup. To her side, are bowls of diced kimchi, persimmons and noodles. All ingredients are grown on or near the temple grounds. 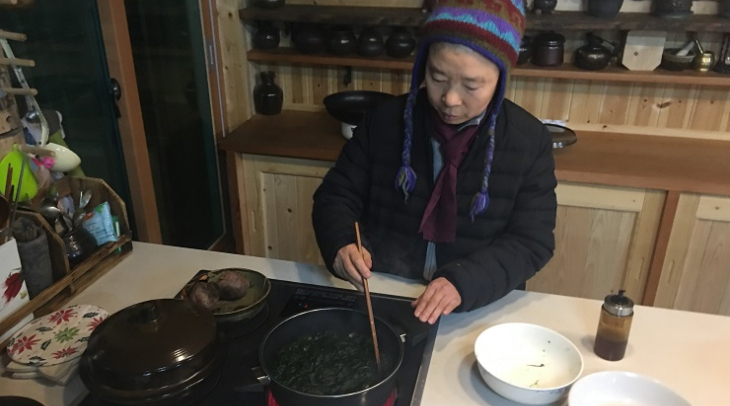 Unlike a lot of Korean cuisine, which relies heavily on salt, pepper paste and other sauces, Jeong Kwan says she keeps her dishes simple. She says you need to taste the food with your entire body. But most people don’t understand that what they put in their mouths, effects them in ways they never expect. And don’t cook when you’re angry either, Jeong Kwan adds. It poisons the food and will make those who eat it angry, too. When dinner is served, we eat soybean stew, shitake mushrooms and multigrain rice. It’s a delicious feast. But Jeong Kwan doesn’t think its anything special. She says food is just fuel for her meditation. She never actually craves anything. Giving up wanting food? I find that hard to swallow. I also can’t believe she doesn’t crave anything from outside the temple. So before I said good-bye to Jeong Kwan, I had to ask if she has any guilty pleasures. What she told me was, well, enlightening. Vanilla and green tea flavored ice cream to be exact, Jeong Kwan tells me.